The Alaska Volcano Observatory (AVO) is a joint program of the United States Geological Survey (USGS), the Geophysical Institute of the University of Alaska Fairbanks (UAFGI), and the State of Alaska Division of Geological and Geophysical Surveys (ADGGS). No eruptive activity was detected in regional seismic or infrasound data over the past week. Elevated surface temperatures were observed throughout the week, but no new lava effusion or changes in the summit vent have been detected in satellite data. There has been no evidence of dome growth or changes within the summit crater since early March 2019. Additional episodes of lava effusion and explosions are likely and will occur without advance warning. The most recent explosion of Cleveland occurred on January 9, 2019. These explosions are normally short duration and only present a hazard to aviation in the immediate vicinity of the volcano. Larger explosions that present a more widespread hazard to aviation are possible, but less likely and/or frequent. Local seismic and infrasound data at Cleveland have been offline since January 26, which restricts AVO's ability to rapidly detect an explosive eruption. AVO continues monitoring for signs of eruptive activity with satellite, lightning, and regional seismic and infrasound data. Cleveland volcano forms the western portion of Chuginadak Island, a remote and uninhabited island in the east central Aleutians. The volcano is located about 75 km (45 mi) west of the community of Nikolski, and 1500 km (940 mi) southwest of Anchorage. The most recent significant period of eruption began in February, 2001 and produced 3 explosive events that generated ash clouds as high as 39,000 ft above sea level. 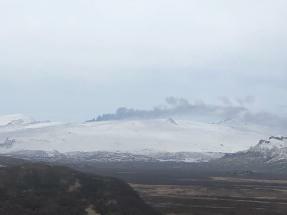 The 2001 eruption also produced a lava flow and hot avalanche that reached the sea. Since then, Cleveland has been intermittently active producing small lava flows, often followed by explosions that generate small ash clouds generally below 20,000 ft above sea level. These explosions also launch debris onto the slopes of the cone producing hot pyroclastic avalanches and lahars that sometimes reach the coastline. Slightly elevated surface temperatures consistent with cooling lava flows were observed during periods of clear weather this week. Low-level seismicity continued throughout the past week. The level of unrest observed over the past several months indicates that eruptive activity has paused or stopped. Pauses in eruptive activity are common at Veniaminof. Lava effusion, ash emissions, or both could resume at any time without significant associated seismicity. 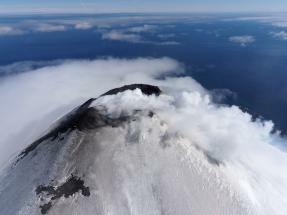 Veniaminof volcano is monitored with a local real-time seismic network, which will typically allow AVO to detect changes in unrest that may lead to a more significant explosive eruption. AVO combines seismic, infrasound, lightning, and satellite data for rapid detection of such events. Mount Veniaminof volcano is an andesitic stratovolcano with an ice-filled 10-km diameter summit caldera located on the Alaska Peninsula, 775 km (480 mi) southwest of Anchorage and 35 km (22 mi) north of Perryville. Veniaminof is one of the largest (~300 cubic km; 77 cubic mi) and most active volcanic centers in the Aleutian Arc and has erupted at least 13 times in the past 200 years. Recent significant eruptions of the volcano occurred in 1993-95, 2005, and 2013. These were Strombolian eruptions that produced lava fountains and minor emissions of ash and gas from the main intracaldera cone. During the 1993-95 activity, a small lava flow was extruded, and in 2013, five small lava flows effused from the intracaldera cone over about five months. Minor ash-producing explosions occurred nearly annually between 2002 and 2010. Previous historical eruptions have produced ash plumes that reached 20,000 ft above sea level (1939 and 1956) and ash fallout that blanketed areas within about 40 km (25 mi) of the volcano (1939). Information on all Alaska volcanoes is available at : http://www.avo.alaska.edu.